Plano, acrylic on canvas by artist Tesa Morin. “Borderlands” opened to the public Jan. 24 with a brief lecture about the works by Morin. 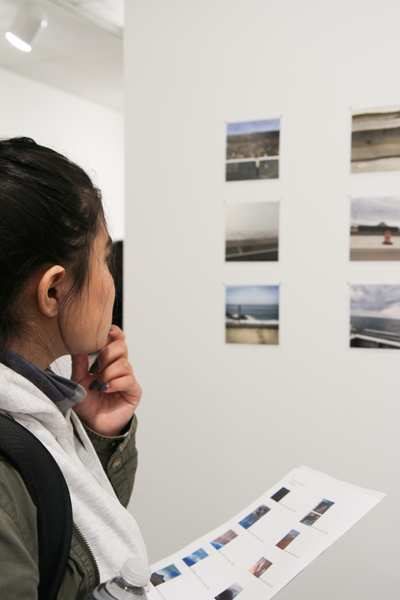 “Borderlands” will be on display until Feb. 22 in F-219C. Gallery manager Iris Bechtol was an undergraduate at the University of North Texas when Morin was in graduate school. Bechtol knew about Morin’s work as a photographer but only recently learned about Morin’s paintings by following her on Instagram. Bechtol said she chose to feature Morin’s latest work because she likes how Morin makes her audience think about all kinds of barriers and borders. 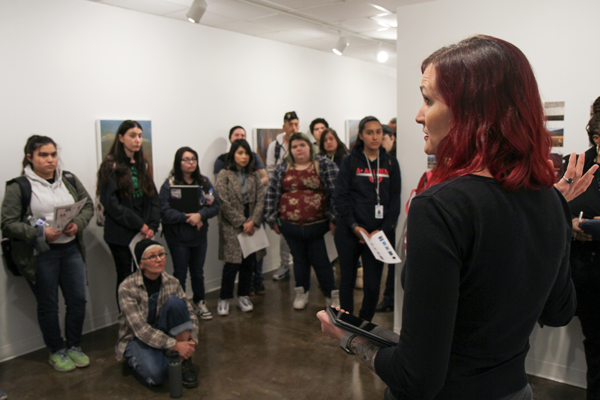 President Donald Trump’s proposed wall along the U.S.-Mexico border had a big influence on the creation of “Borderlands,” said Morin at the gallery opening. She wanted her viewers to think about the theme as not only national border walls but also simple boundaries like barbed wire or emotional boundaries that people put up. Morin said that while “Borderlands” only features paintings of land and water, she is fascinated by the human component her work presents. At the back of the gallery are several dozen photographs that inspired the paintings of “Borderlands.” Whether the paintings were made from direct or indirect inspiration of the photographs, Morin was quick to point out quirky details and inside jokes within each photo. Art major Michael Camp came to the gallery opening with some classmates. He said the piece “Plano” was his favorite because of the contrasting colors of gray and sky blue. Social work major Bonnie Gibson said she’s never been interested in art, doesn’t understand art and didn’t enjoy viewing the gallery, but she still enjoyed learning about Morin’s perception of boundaries. “I think it helped me get a feel of how to entreat people,” Gibson said. Morin’s work with painting and photography can be viewed on her Instagram profile, @tesamorin.